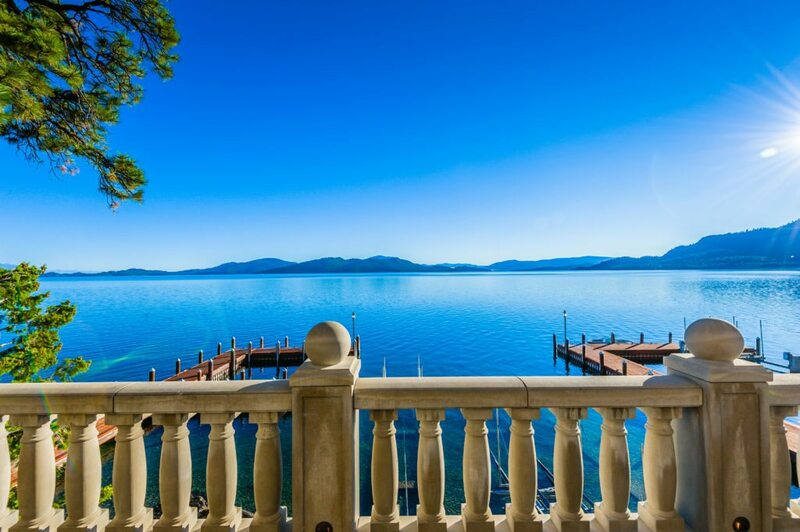 This majestic mountain aerie, Shelter Island Estate, sits atop a solid granite foundation on 24-acre Shelter Island, rising from Montana’s Flathead Lake; one of the top 3 cleanest lakes in the world. 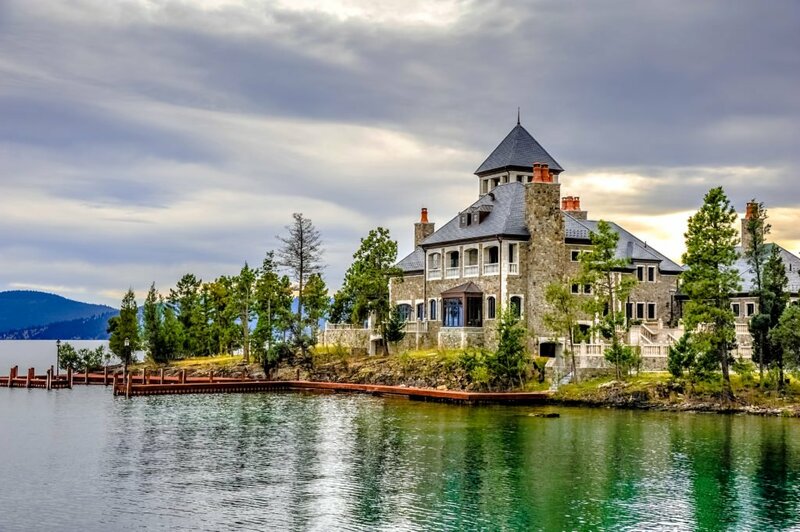 This rare offering, currently the largest private home in Montana, features over 32,000 square feet of structures and commands 7,000 feet of prime lakeside frontage, extremely unique for private ownership. 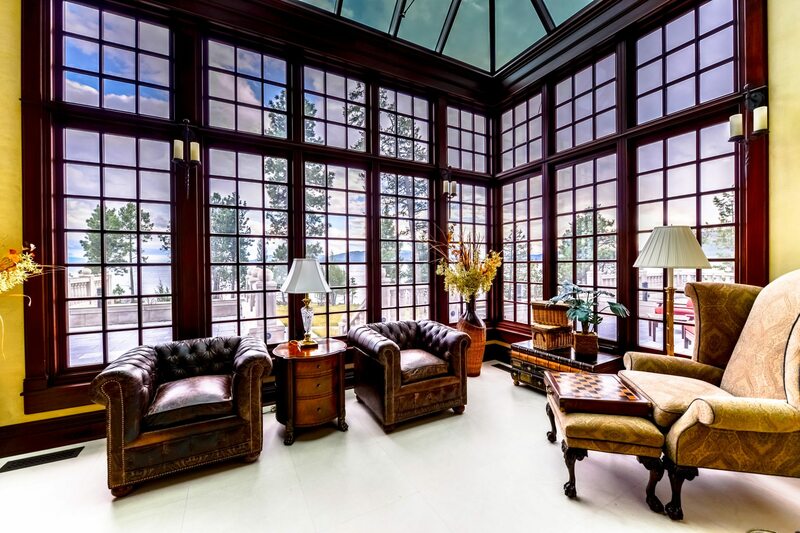 Being situated next to Glacier National Park is one more facet in this incredible jewel of a property. 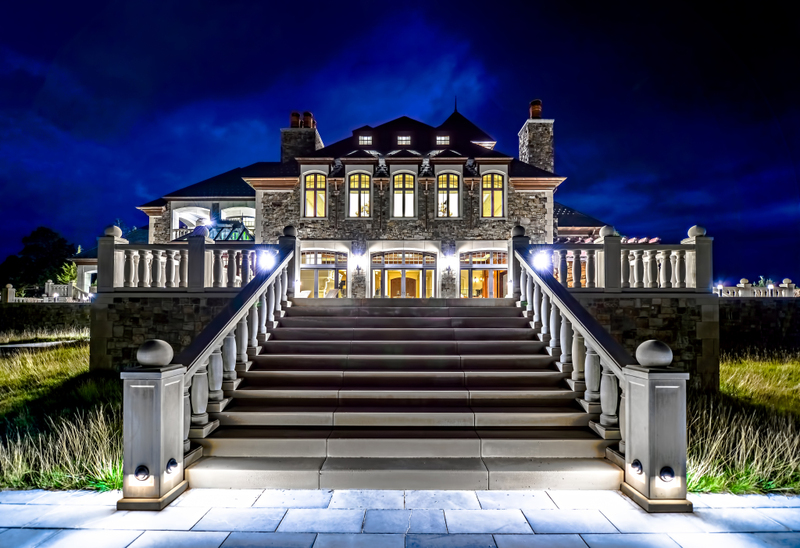 The 5 bedroom/8 bath Main House is over 24,000 square feet with 10,000 square feet of heated porticos and outdoor entertaining space that surrounds the residence and allows indoor/outdoor living and entertaining on the largest scale. 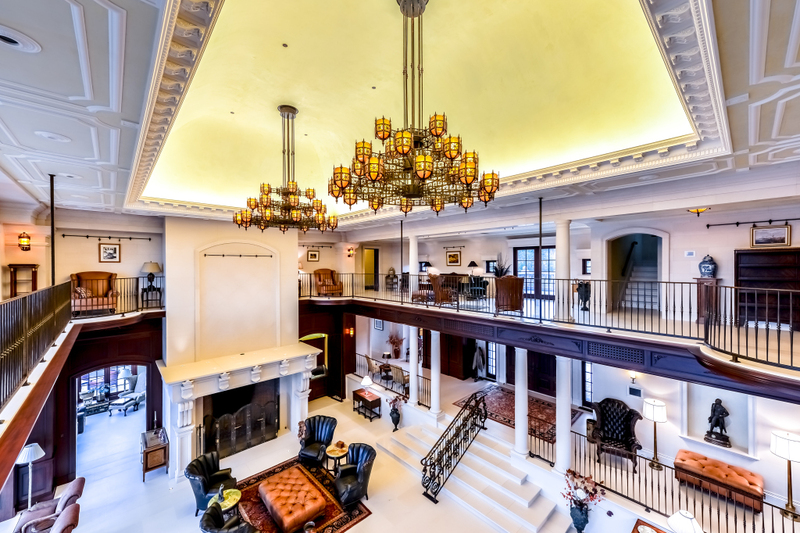 The Great Room features 45-foot ceilings with a 2nd story gallery that encircles the room. 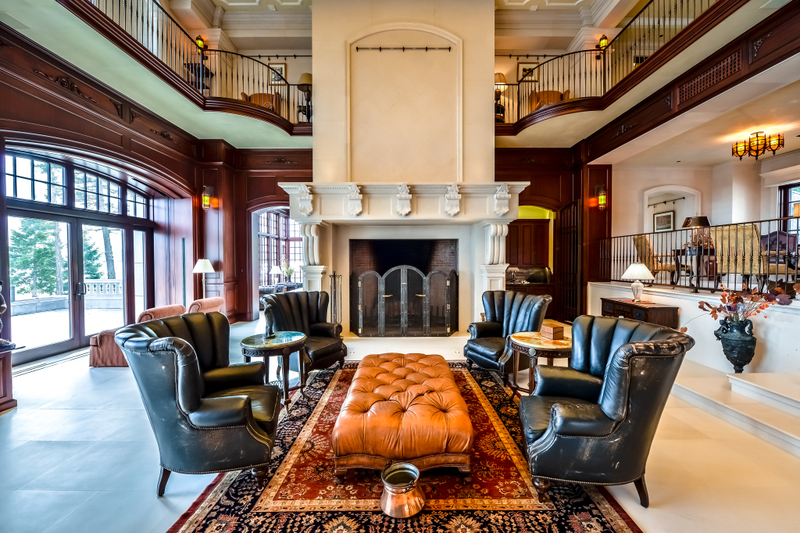 On one end of this baronial hall is a limestone fireplace and at the other end, a 120-inch television, custom built into the lustrous mahogany panels. 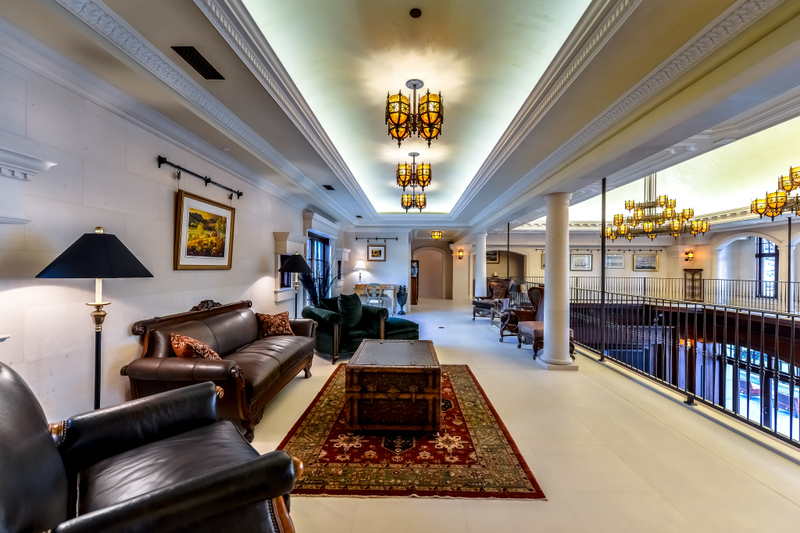 A gleaming, copper Conservatory is the perfect place to watch Montana wild life unfold before your eyes, in all seasons. It captures year-round natural light and illuminates the space between the grand hall and the mahogany-lined Office. 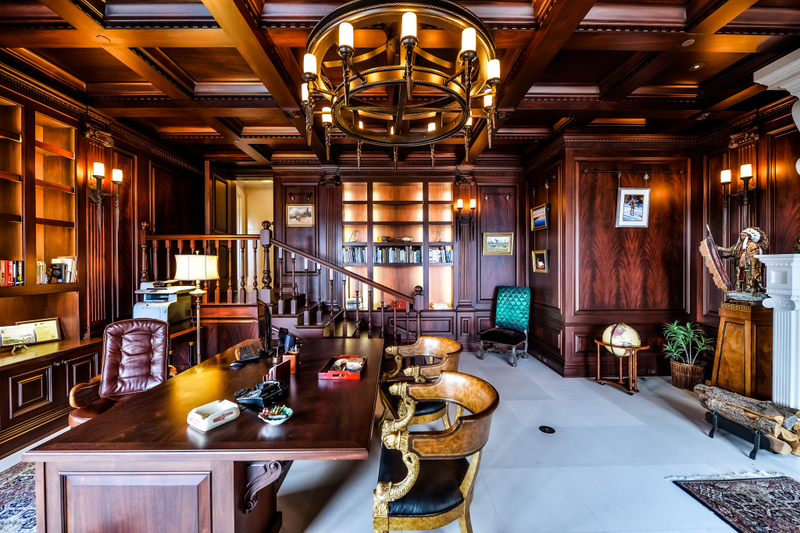 Additional compliments of the Office include another limestone fireplace and 4 inch thick doors that open onto the main portico. 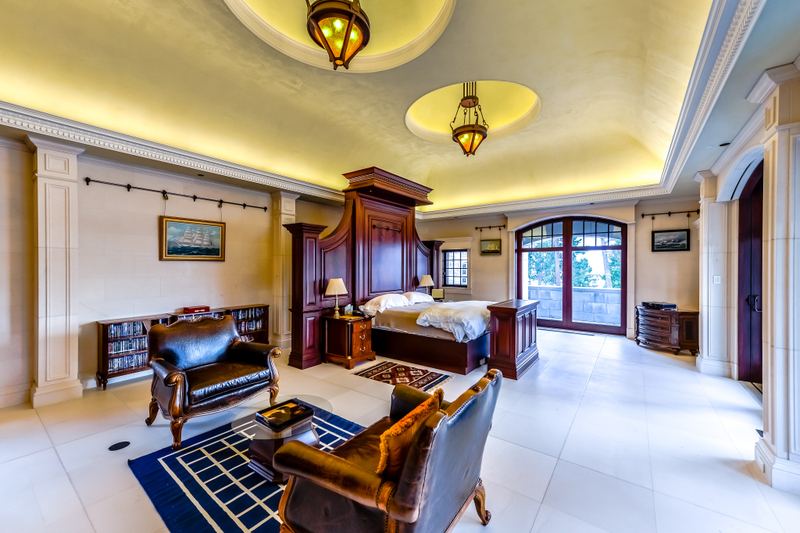 The Master Bedroom Suite is the centerpiece of the main floor with wrap around porticos and porches, a domed ceiling with delicate umber, coved lighting. 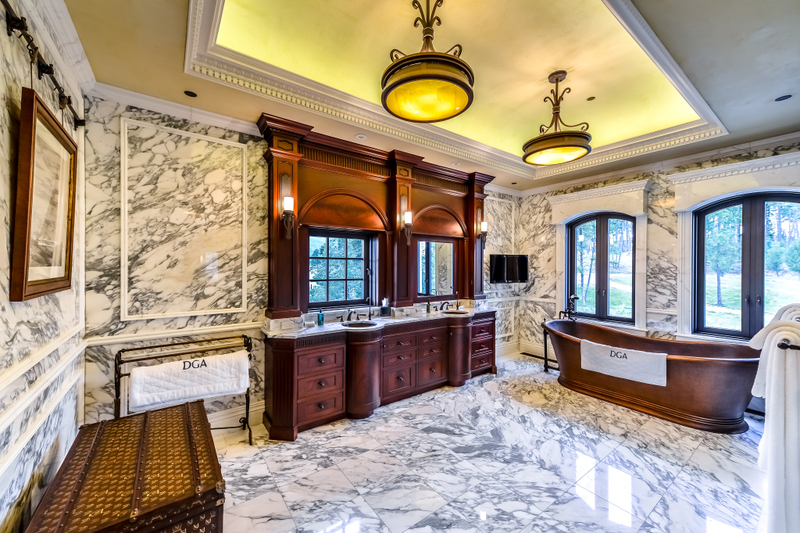 The mahogany closet, with refrigerator, leads to the expansive Master Bathroom with black and white Carrara marble. 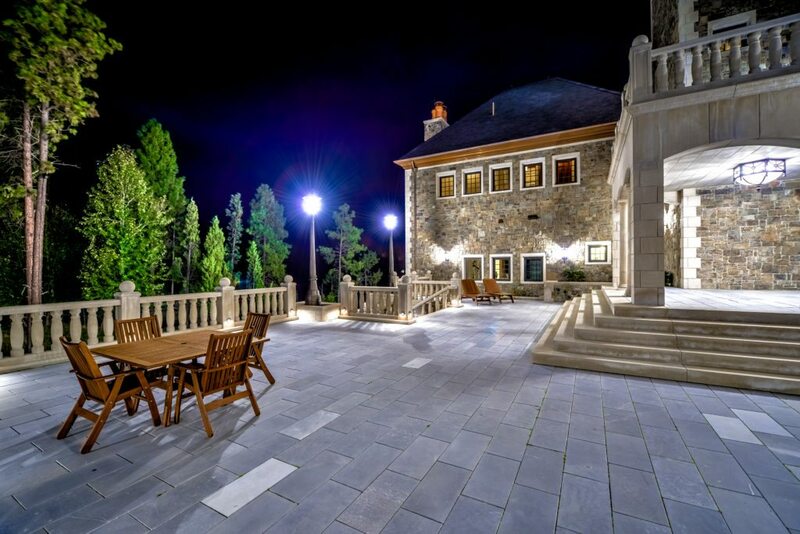 Additional 4 bedrooms feature the same quality and craftsmanship as used throughout the estate. 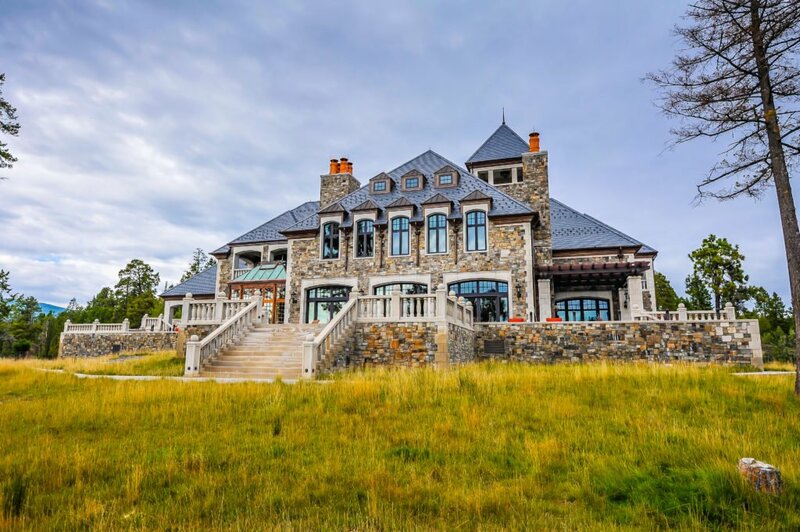 The Main House also features a Wine Cellar, an Indoor Shooting Range, and Gym with lake views and large shower and steam bath (one of 4). 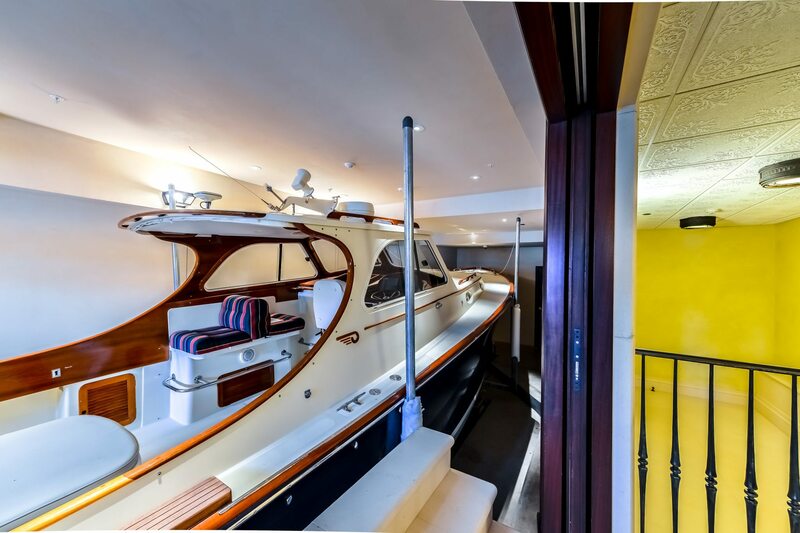 The ground floor also has a heated Boat Stall served by a dedicated rail system to access your boating craft with the greatest of ease. 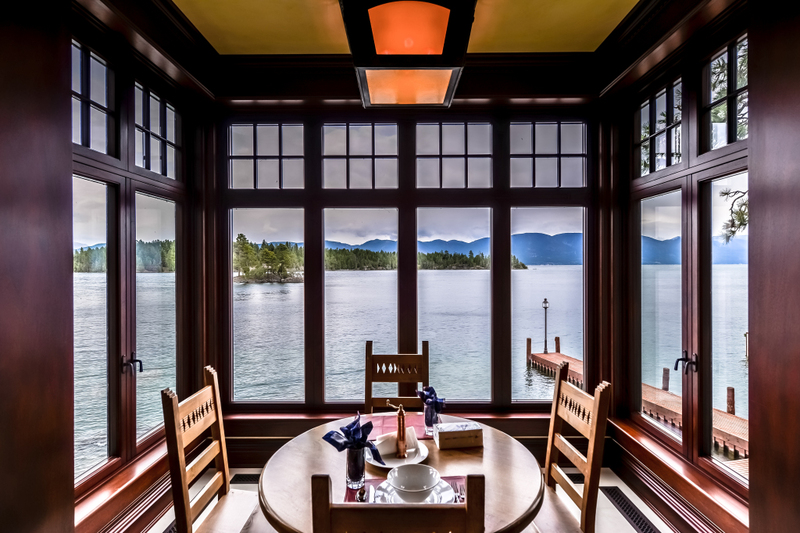 The Dining Room, Kitchen, and Breakfast Room boast the same architectural details and fine finishes found throughout the home, along with gorgeous views of the lake and vistas beyond. 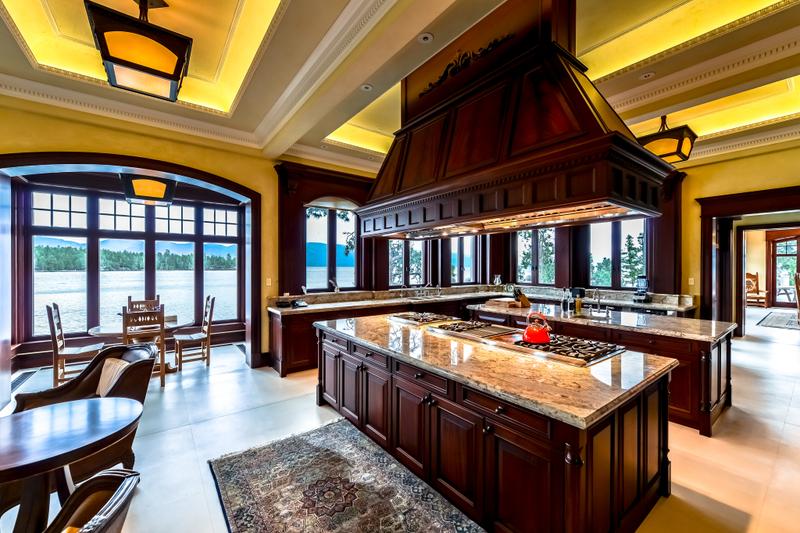 Two pantries, glass door refrigerator/freezers, several under counter cooling boxes, trash compactors, food warming drawers, multiple dishwashers and stainless steel gas stoves are just a portion of the amenities ready to assist the finest gourmet chef and staff. 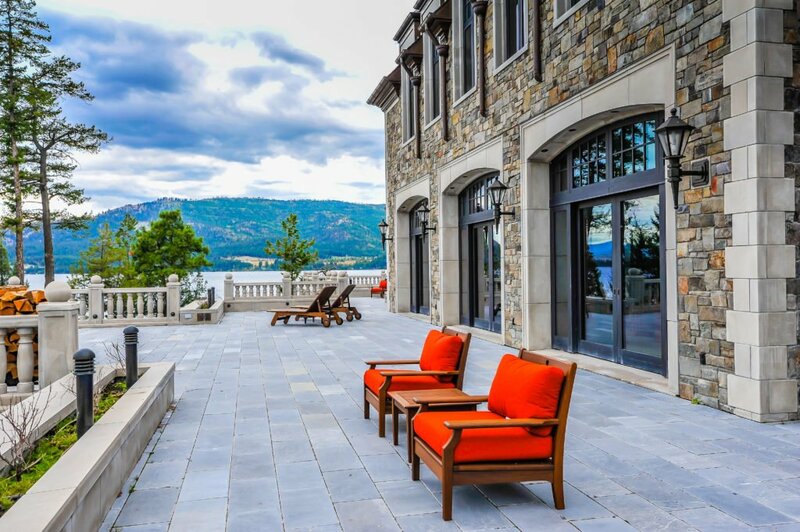 Materials used throughout the estate include: lustrous African Mahogany installed by hand, French Limestone, Italian plaster, copper and bronze custom double pane windows, just to name a few. 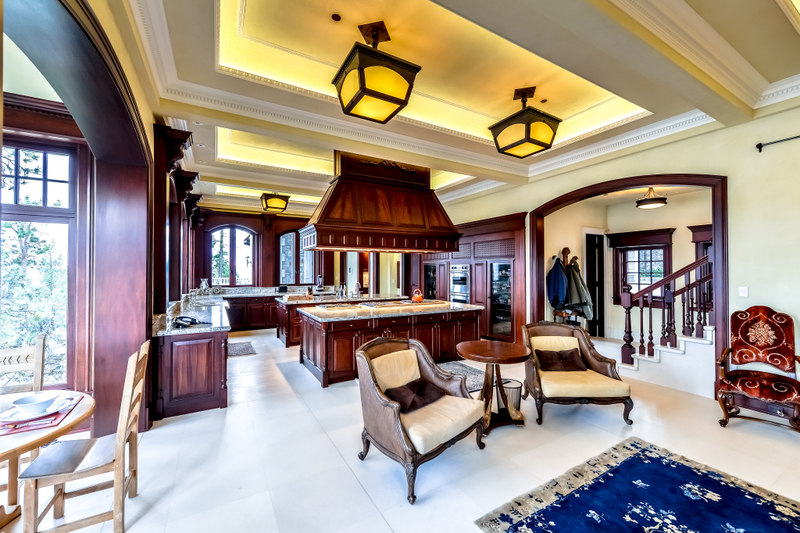 The numerous and varied ceiling designs throughout the estate include: vaulted, coved, domed and coffered ceilings, inlaid with mahogany or accented with delicate architectural details and raised panels. 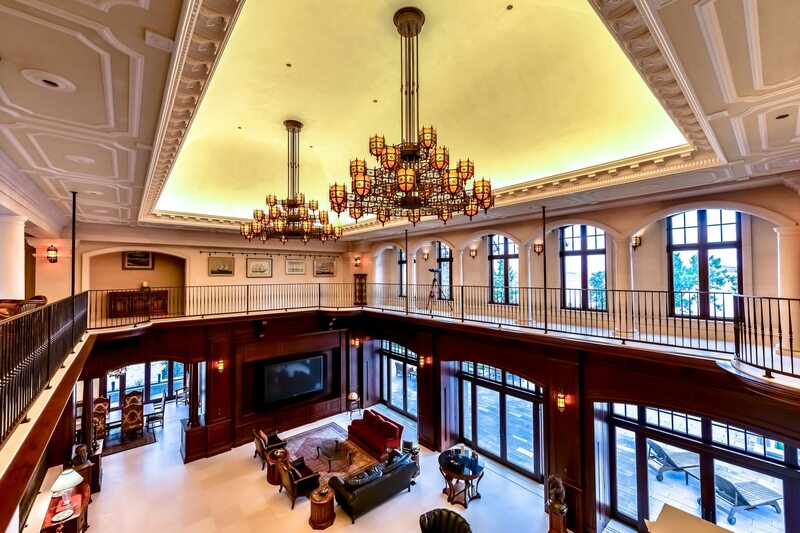 Each ceiling boasts a unique coved lighting system that is backdrop for the commanding, exquisite main light fixtures and chandeliers collected from around the world. 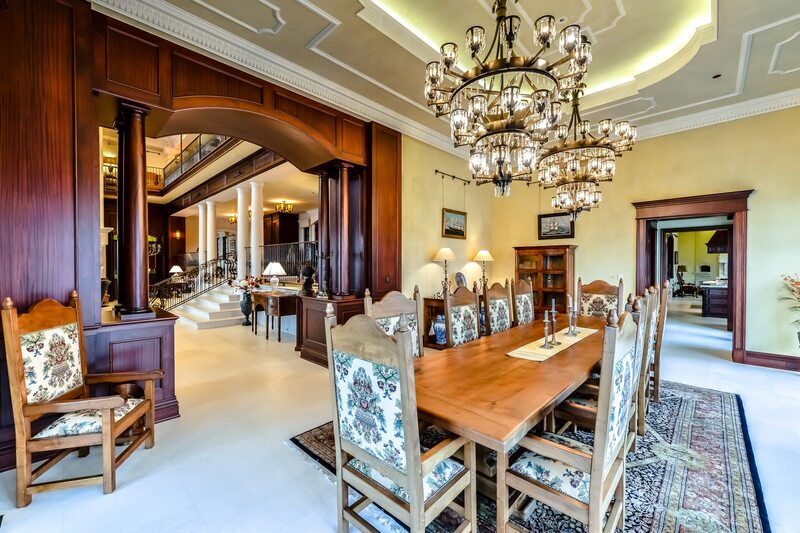 Architectural details, too numerous to mention, are consistent throughout the estate. 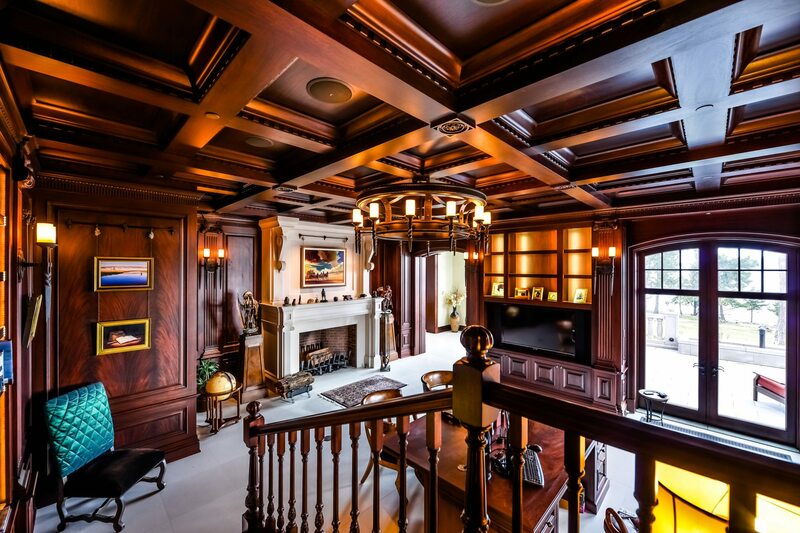 Elegant corbels, grand colonnades, hand forged ironwork and detailed wainscoting are just some of the examples. A commercial grade elevator to all three stories serves the house. 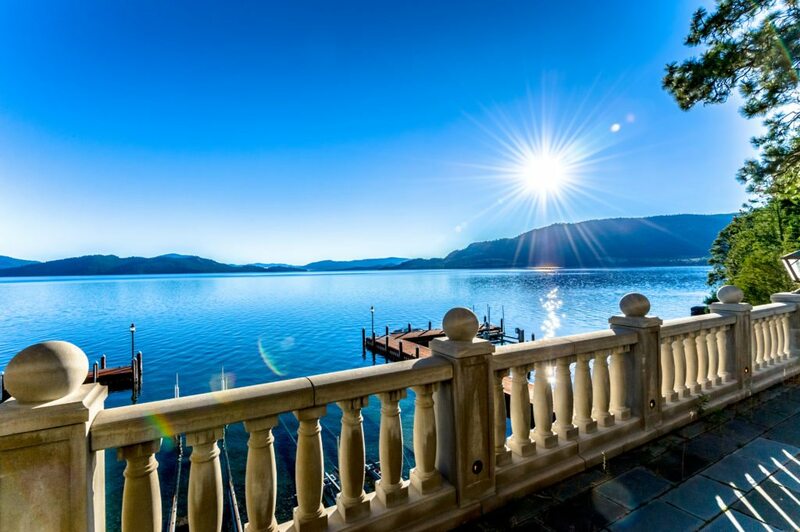 The 2 bedroom 4 bath guest/boat house is of the same quality and materials as the entire estate. 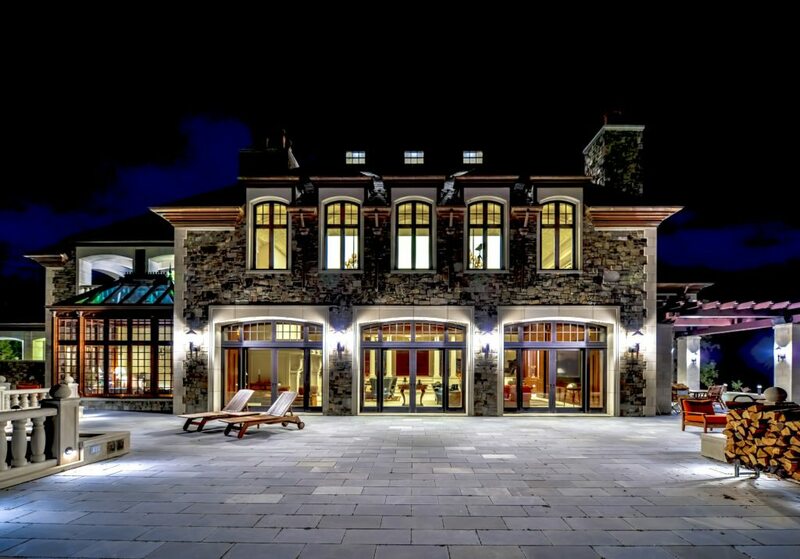 Its 5,289 square feet on three stories represents a smaller compliment to the main residence. 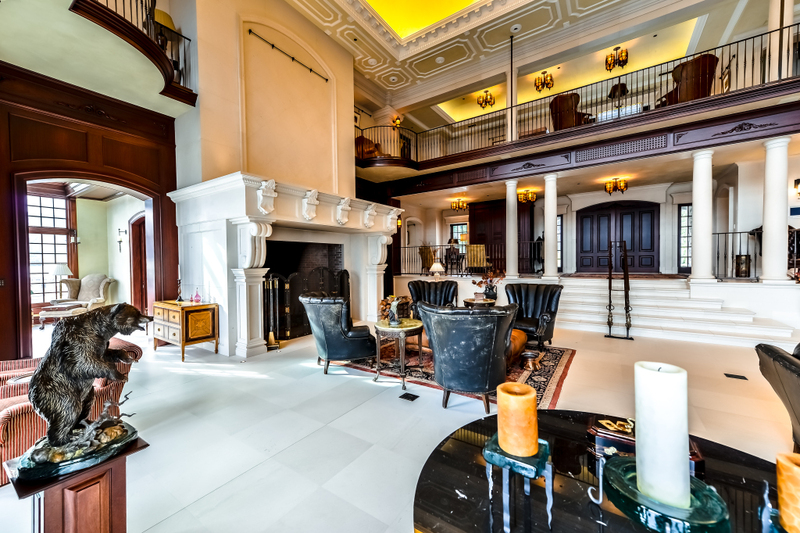 Two granite fireplaces, and a steam room are additional amenities. 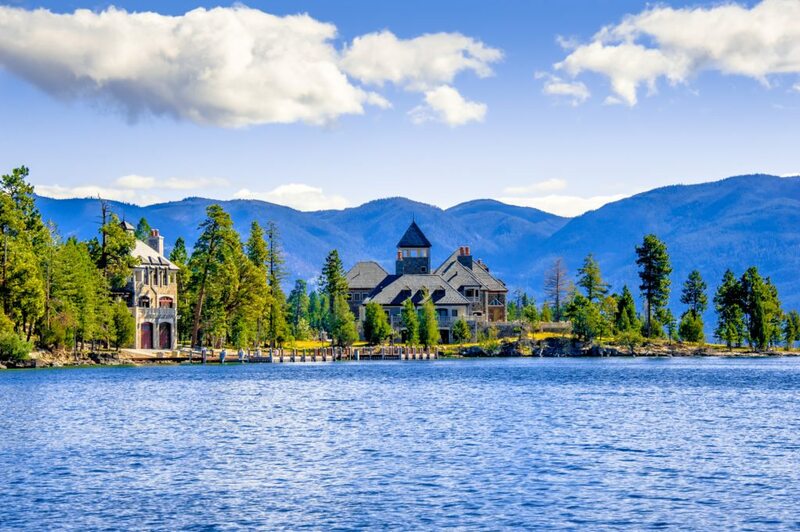 The entire structure is hewn of stone, copper, and other natural materials and appears to have stood for centuries. 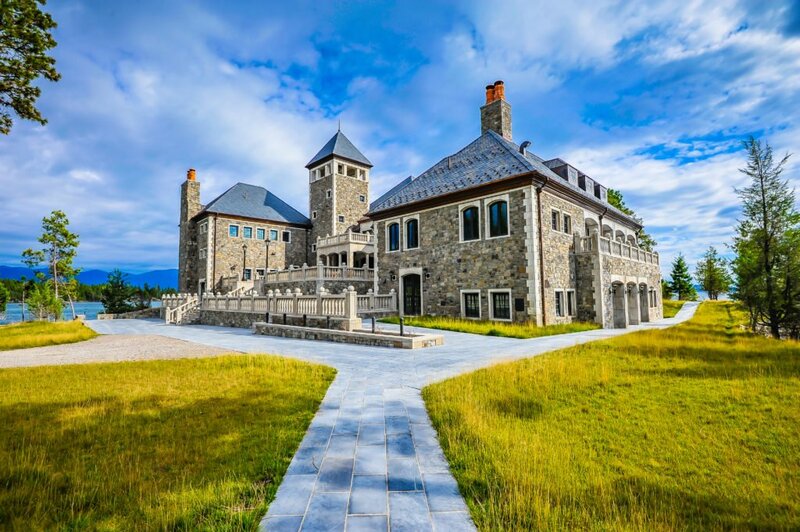 Exterior details include lichen-covered native Montana chief cliff stone, trims of custom copper and Indiana Limestone, a blue/black Virginia slate roof. The large tower presiding over all the roofs, looks directly into an eagle egret nest across the small bay. 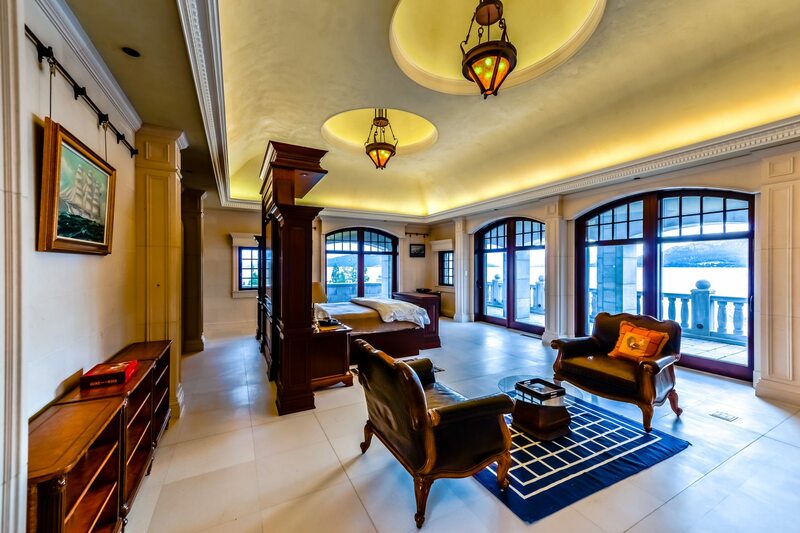 Each main room has outside sliding doors to allow indoor/outdoor living and entertaining. 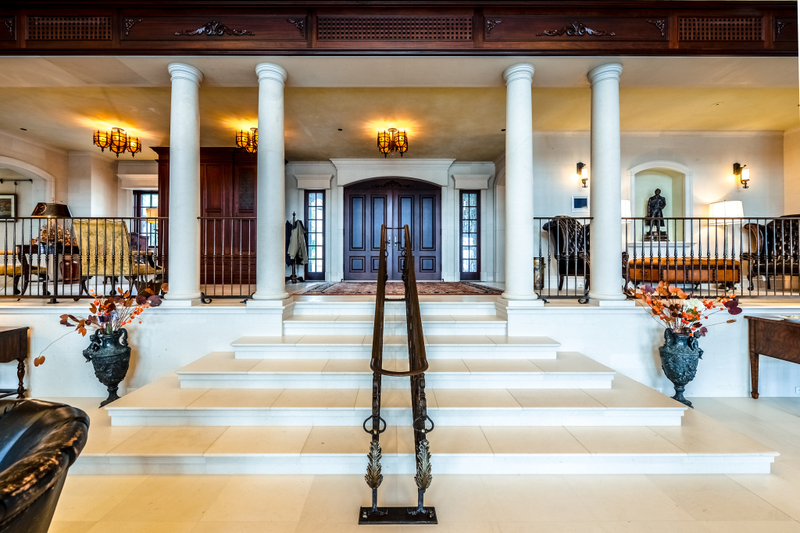 The main floor features an elevated entry with a porte-cochere accessed by the guest floor level. 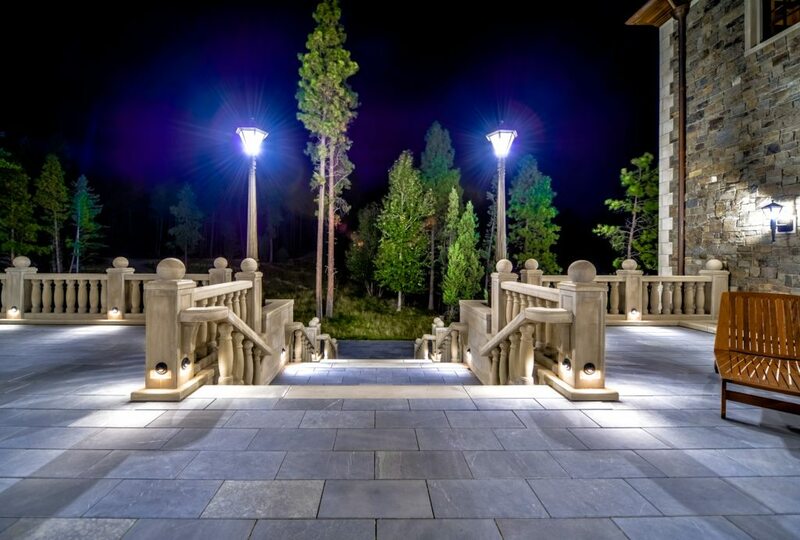 Beneath the surface of handsome and rugged mountain compound are modern day marvels and sophisticated engineering. An underground/underwater armored utility cable carries 12,000 amps to the island, along with CAT-5 computer cable and phone, and is engineered to handle additional development for an even larger compound, with three additional pre-installed services. 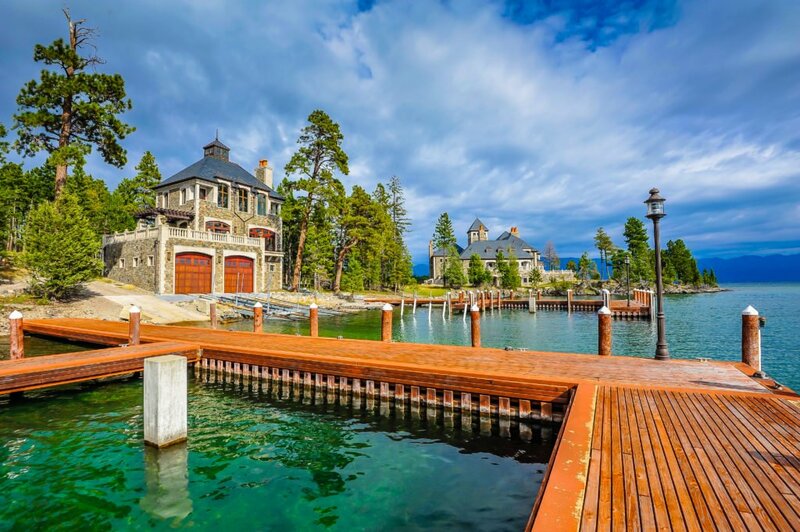 An underground watering and hydrant system keeps the island green while also serving as a fire first line of defense. The 24.3-acre island is fully improved with a world class Sporting Clay Course and a nearly 1-mile road that links the shooting course while serving as a beautiful walking or Jogging Trail. There are three Docking Systems for outside storage and landing of boats. Three computer-controlled tracks transport boats from water to dry dock, without riders ever leaving the craft, or handling a line. A 1,200 foot Utility Building, contains a 100 kW diesel generator and electrical panels. 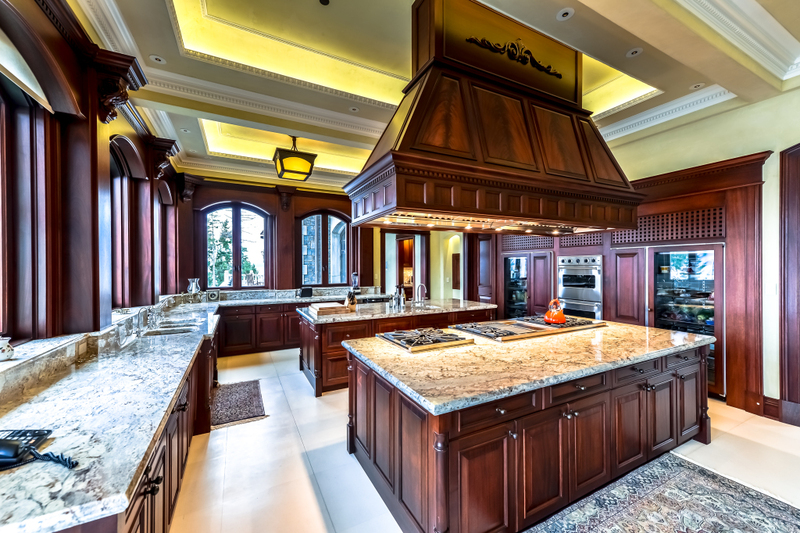 The 1,800 square foot Workshop is styled in the same manner and detail as the main house. Buildings included in the development total over 44,000 square feet. The two parcels on shore are nearly 8 acres, total. Shelter Island consists currently of three structures, with the ability to build three more compounds.